KABUL (Pajhwok Afghan News) — Afghan lawmakers warned the government against growing confrontation between Russian and the US which would badly affect the situation in Afghanistan. Earlier, Deputy Foreign Minister Hekmat Khalil Karzai said that confrontation between the US and Russia had increased and added the two major powers were shifting their rivalry from Ukraine to Afghanistan. 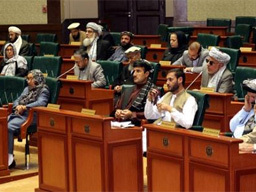 Several members of the Mesharano Jirga on Sunday expressed concern over the growing insecurity and asked the government to take steps to prevent Afghanistan becoming second Syria. Political stability and security situation in the country was unacceptable for the people and we should not allow Afghanistan to become a ground for the rivalry of major powers. He said the government should adopt policies which would prevent Afghanistan from becoming second Syria. Senator Mohammad Alam Azedyar said that rivalry between Moscow and Washington was being shifted to Afghanistan and the government should be careful not to convert Afghanistan into a battleground for rival forces. Other lawmakers shared similar views and asked the government to take steps to prevent Afghanistan from becoming a battleground for foreign forces. Some senators expressed concern over the existing security situation of the country. Gulali Akbari, a lawmaker from Badakhshan province, said that the Sayedabad district felt to the Taliban last night and fighting reached close to capital Kabul. “Unless elders and Mujahidin are not fully made part of the government the situation will not improve,” she believed. Senate Chairman Fazal Hadi Muslimyar said no one wanted that major powers to clash in Afghanistan and convert the country into the laboratory of US and Russian weapons.